I want to lose weight. Really. I mean, I just gained 30lbs over the last 18months thanks to the magical folks at Chipotle and it’s time for a change. Problem is, every time I invite my friends to come jogging with me plans fall through and then I have another excuse to inhale half of a blueberry cheesecake. Admittedly, I’ve sunk pretty low, but I’m not sure if I’ve reached the point where I need a robot to whip me into shape. Maybe I do though, and the guys behind the Joggobot have created one of the oddest contraptions to help nerds lose weight by chasing them around with a deranged robot quadrocopter. The Joggobot is kind of like a super nerdy jogging companion. Using colored titles on a t-shirt, the Joggobot hovers infront of you while you run around the block trying to sweat off all your extra pounds. It’s based on the AR. 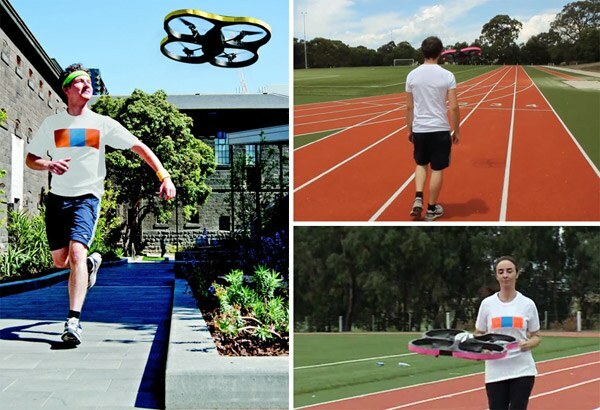 Drone, and was created by Floyd Mueller and Eberhard Grther at the Royal Melbourne Institute of Technology in Australia because they thought it would be freaking awesome to live in some sort of apocalyptic world where running from robots is the only way to survive. As soon as the onboard camera sees the shirt, the Joggobot takes off and can be controlled so that it flies ahead of the jogger at a pre-determined pace. The technology behind it is pretty cool but simple and could be manufactured on a commercial level. No word on whether or not Flod and Eberhard plan to sell these bad boys – or equip them with machine guns to provide extra motivation. In the meantime, we suggest joining a gym or buying a puppy if you’re in desperate need of a friend to job with.